1) In this paper was presented at the FIG Working Week, 17-21 May 2015 in Sofia, Bulgaria. The paper presents a conceptual model for information system for expert express evaluation of the earthquake risk over the Bulgarian territory using GIS. Several damaging earthquakes have shaken the Bulgarian territory since 1818. To reduce the damages it is necessary to have at disposal preliminary estimates of frequency and magnitude of the earthquakes, particular engineering characteristics of the seismic action and relevant opportunities for disaster management. According to recent decades statistics the earthquakes cause major damages and casualties among all natural disasters, followed by floods and tropical cyclones. The annual risk for victims of earthquakes all over the World is estimated at 10 000 - 15 000 people per year. Several damaging earthquakes that shake Bulgarian territory (1818, 1858, 1904, 1928, 1977, 1986, 2012) led to significant damage. About 360 victims due to earthquakes are reported in Bulgaria since 1901 until now. To reduce human losses and damages it is necessary to have at disposal preliminary estimates of frequency and magnitude of the earthquakes, particular engineering characteristics of the seismic action and relevant opportunities for disaster management. Earthquake risk estimation and management encompasses large quantity of heterogeneous information data sets, including different types of maps, statistical information and expert knowledge. This paper represents some of the efforts, performed within the framework of the university UACEG-CNIP research project dealing with a conceptual model for information system for expert express evaluation of the earthquake risk over the Bulgarian territory using GIS. It examines some problems that arise in thematic mapping for disaster management in case of earthquake due to the various types, structure and classification of data provided by various organizations. Main stages for data harmonization including georeferencing the information into a geographical reference system, standardizing the object classification, standardizing the level of detail, unifying the cartographic visualization are discussed and some advantages of the use of thematic maps for disaster management in case of earthquake are presented. The resulted maps aim to contribute to holistic seismic risk estimation for the territory of Bulgaria. These maps, logically coupled with the all information data set that has been collected and systematized within the framework of this project, would provide useful information for decision makers and stake holders, dealing with earthquake risk mitigation. Expert evaluations of seismic risk assessment is based on the expected damage and opportunities for disruption of the status of various systems such as destruction, impaired functioning, capacity reduction, etc. as a result of an earthquake (Kouteva-Guentcheva and Pashova, 2014). The success of disaster management depends on availability and effective use of information (Altan and Kemper, 2010). For disaster management in case of earthquake the responsible authorities need a large amount of data - the experts involved in earthquake risk estimation need various data such as: seismic hazard information, geological information, building stock information, demographic and social information, business / communications / industry information, infrastructure information - Figure 1 (Pashova et al., 2015; see this issue). Cartography plays a very important role in presenting all these data on special maps intended to be used for disaster management in case of earthquake. Konecny and Bandrova (2006) have formulated the role of cartography in disaster management “to simplify and well-arrange required spatial data” thus the decision-making process to become quicker and better and to lead to damage minimization. Different authors work on mapping of seismic hazard information and geological information. This paper is focused mainly on thematic mapping of demographic and social information and business / communications / industry information. Generally, the visualisation of information depends not only on the type of data but also on the type of user, including gender, age, disability, behaviour, preferences, habits, task responsibilities, and other characteristics. Many current products (e.g., maps, images, web sites, and 3D environments) for crisis management borrow the colour schemes, symbols, and maps’ content from existing, application-oriented software, systems, models, and visualisations (Bandrova et al, 2012). Effective disaster management and decision making in case of earthquake require accurate information in the right place at the right time. Depending on the role of participants in these activities, they need specialized geographic information to support their specific actions (Marinova, 2014). Main source of such information are thematic maps, which serve as a tool for risk assessment. The expert risk estimation is based on a quantitative definition of risk coupling "V = vulnerability", "H = hazard" and "E = exposed elements or assets" (Varnes, 1984). Among the available different extended definitions of vulnerability, the United Nations/International Strategy for Disaster Reduction (UN/ISDR), for example, defines vulnerability as the “conditions determined by physical, social, economic and environmental factors or processes which increase the susceptibility of a community to the impact of hazards (UN/ISDR, 2004). The multidisciplinary holistic risk estimation approach aims to measure risk and vulnerability through selected comparative indicators in a quantitative way in order to be able to compare different areas or communities (Davidson and Shah, 1998; Vahdat and Smith, 2010 and references in). For this reason the risk estimation procedure in general starts with defining the scope of analysis and the corresponding indicators that may contribute in the risk’s elements. Maps representing health sector - number of hospital beds. All these maps provide useful information for different risk assessments and further risk mapping that would help decision makers and stake holders to understand the needs for sustainable planning and to support the integrated crisis management (Altan and Kemper, 2010). The mapped information might be used for different aspects of the earthquake risk evaluation and damage prevention – e.g. loss estimations, cost analysis, insurance policies. The latter are determined differently and can vary widely depend on several factors – e.g. location that reflects the level of seismic hazard, time of design and construction, building structure type, number of floors, etc. Regarding the building stock, pursuant to the Law for Census of Population and Housing in the Republic of Bulgaria, in 2011 subject to the census are residential buildings. The collected information on existing buildings contains: type, location, number of floors, material of which the building is constructed, the availability of solar panels, year of construction, availability of a lift and number of dwellings in the building. To our regret, these characteristics are considered independently, e.g. the number of floors is not related to the structural construction type or building material. The available statistical information shows that almost more than 50% of the buildings in Bulgaria were built before 1987 (National Strategic Plan for Building Wastes Management and Demolishment for 2011-2014). They differ because of the heterogeneity of building structural systems, materials used, the construction period and number of floors. The enforcement of building codes is followed for buildings constructed during the last several decades. Their design complies with a certain level of seismic protection predefined by the building codes and standards in effect at the time of construction. The maps of short-term statistics on residential buildings, representing the newly built housing constructions (pre-fabricated, brick, concrete construction, etc.) indicates the relative ratio of the different type of construction in the different regions of the country and might provide information on various trends in the buildings construction. The maps depicting new buildings with different construction for 2010 (figure 2) and 2013 (figure 3) show that in 2010 are built mainly concrete structures, while in 2013 are built mainly brick structures. Diminishing trend of this building construction is observed in the last years. The highest rate of new construction in 2010 is observed in the regions along the Black Sea, followed by the Plovdiv, Sofia and Veliko Tarnovo regions. The trend in 2013 is almost the same with the exception of the Plovdiv region, which joined the regions with highest rate of construction. It is worth mentioning that Plovdiv and Sofia are among the regions that are exposed to the highest seismic hazard in Bulgaria. Further effort of our team will be targeted towards finding the relevant way to tie these results with other available data for the building stock and appropriate generalized vulnerability estimation. The most advanced approach of assessing the vulnerability of the existing buildings and structures, certainly, is to base this analysis on particular computations targeted on representative buildings structural systems. Due to the lack of such data, the vulnerability estimates of the existing buildings stock for the purpose of this study will be based either on the buildings classification, provided in the European macroseismic scale EMS 1998 (Grunthal, 1998) or on the available data published in the scientific literature. European Seismological Commission (1998) states the differentiation of buildings into vulnerability classes from A to F according to the type of building structure: masonry, reinforced concrete, steel and wood. The damages of the buildings under earthquake are associated with the type of the structure. The Classification of damage covers five grades, starting from Negligible to slight damage (Grade 1); Moderate damage (Grade 2); Substantial to heavy damage (Grade 3); Very heavy damage (Grade 4); ending with Destruction - Grade 5. For each intensity degree the effects on population and buildings are described. Thus the vulnerability class, damage level and population are integrated in the integrated macroseismic intensity twelve degree scale. Suitable recent structure topology for the Balkan countries was provided by the RISK UE Project, in which buildings are classified according: (i) major material and structural system (masonry, reinforced concrete, steel and wood); (ii) number of floors and overall height – 3 classes high-, mid- and low-rise and (iii) level of seismic code, used for design and construction of particular building – N à no code; L à low code; M à moderate-code and H à high-code (comparable with Eurocode 8). Figure 2. Map of newly built housing constructions for 2010. Figure 3. Map of newly built housing constructions for 2013. Another quantity that is indirectly related to loss evaluation and earthquake insurance industry is the useful living area of the housing fund. Map of the housing fund - useful living area - for the year 2013 is shown in figure 4. The map representing useful living area for 2013 (figure 4) shows larger proportion to the cities – the largest one is in Sofia (29-32 mln m2), followed by Smolyan, Kardzhali (24-29 mln m2), Plovdiv (17-24 mln m2), Sliven, Varna and Burgas (11-17 mln m2). Again one can see that the largest useful living area of the housing fund is documented logically in the capital as well as in Plovdiv – both cities fall in the zones of most severe seismic hazard in Bulgaria. Figure 4. Map of useful living area for 2013. Maps representing business statistics - number of building permits issued in 2010 and 2013 are also prepared. The comparison between these two maps has shown that the number of issued permits for construction of administrative buildings in 2010 and 2013 (figure 5) is negligible compared with that of housing and other buildings. Important indicator is the growth of number of building permits in the regions, characterized by recent urban sprawl and severe seismic hazard – the Sofia and Plovdiv districts. Other relevant to the earthquake risk evaluation are the maps representing business statistics – building sectorial statistics in terms of average annual prices for housing for the years 2010 and 2013. The map representing average annual prices for housing for 2010 year (figure 6) shows that the highest average annual market prices are in the districts with higher living and lower unemployment. These districts include the biggest cites in the country such as the capital Sofia, Varna, Burgas, Plovdiv, Veliko Tarnovo, Pleven. Varna and Burgas districts are bordering the Black Sea. There are a lot of summer resorts and developed tourism and industry. The central and north central districts are also with high average annual market prices because of good living conditions there, developed industry and agriculture. Compared to the average annual prices for housing in 2010 and 2013 is noticeable that the prices in some districts decreased significantly, but the developed regional centers retain their standard, e.g. Sofia, Plovdiv, Varna, Burgas, Ruse. Information that this type of maps represents is necessary for insurance compensation in case of earthquake. Figure 5. Map of the building permits number for 2013. A map representing Information Society based - household access to the Internet for 2013 is shown in figure 7. Fortunately, the districts exposed to the most severe earthquake hazards in Bulgaria (Sofia and Plovdiv) are well equipped in terms of internet information service. It might be very important that inhabitants of affected by earthquake areas can be informed on time and to receive constantly updated information in the case of natural disaster and particularly earthquake and/or some co-seismic negative consequences. Informed Society also concerns the possibilities for preventive measures based on risk related information published in the Internet. Data for household access to the Internet can be considered as not classified one. This means that we can speak about big data (BD) and a possible manipulation with it. It could be verified, certified and GIS specialist should find way how to use it. The insufficiency of current software solutions and systems is supported by other researches: „Typically, big data problems cannot be solved with the computing resources that are available to most organizations. They require clusters of computers running special applications, and might take days or even weeks to complete” (Uganes, 2013). Behind the “special applications” are the experts’ knowledge and experience in retrieving valuable information. That is why the need of GI specialists is recognized worldwide. In the past, software solutions replaced people in order to avoid errors. With BD, we are turning back to the expert who is invoked to propose next generation technology solutions, combining multidisciplinary approaches (Bandrova et al, 2014). Following the conceptual scheme of the Information Data Set given in figure 1 and the general procedure for expert earthquake risk evaluation (Pashova et al., 2015, this issue) available published maps (Bandrova, 2008) were scanned and made available as raster images. These maps concern the urbanization process that is observed to be stronger and faster in the high earthquake hazard districts. Evaluating the urbanization process should go in parallel with numerous data including housing information and population distribution models. Given the absence of detailed housing information, one has to resort to approximate models. Often villages contain fundamentally different building compositions of structures than in the cities and for this reason for some countries, different housing inventories are given for two classes: urban and rural (Wyss, 2014). Settlements with the same population numbers may have different building inventories because they may be predominantly administrative, agricultural, touristic, or industrial towns and villages. In parallel, maps representing the transport infrastructure - density of the international, national and regional network; mining and quarrying; electricity network; chemical industry, hospital density have been prepared as raster maps to be included in the basic dataset considered in the BN 164-14 UACEG Project. 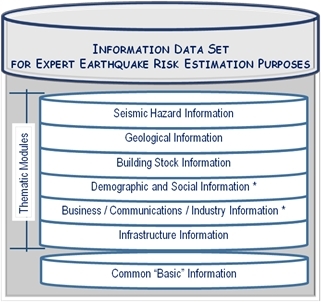 Earthquake risk evaluation encompasses rather heterogeneous information data sets. The integration of these data in a uniform data base requires a lot of multi- and inter-disciplinary efforts. Calibration and verification of the data sets and methods used is important to continue, since to proceed further with the comparative analysis of the available maps and the consequent risk evaluation in GIS environment it is necessary to have at disposal compatible vector maps and/or digitized raster maps with significant resolution. It would be useful and interesting to perform the risk evaluations with different available maps, so some useful observation in terms of sensitivity of the final risk evaluation with regard to different input data sets could be performed. Research project CNIP-UACG БН – 164/14 is kindly acknowledged. United Nations International Strategy for Disaster Reduction (UN/ISDR 2004) Living with Risk – A Global Review of Disaster Reduction Initiatives. 2 vols. Geneva: United Nations. Varnes D.J (1984) "Landslide Hazard Zonation: a review of principles and practice", UNESCO, Paris, 63p. Wyss M. (2014) Ten Years of Real-time Earthquake Loss Alerts, Chapter 6, http://dx.doi.org/10.1016/B978-0-12-394848-9.00006-7, International Centre for Earth Simulation (ICES), Geneva, Switzerland Earthquake Hazard, Risk, and Disasters. Dr. Eng. Silvia Marinova is General secretary of Bulgarian Cartographic Association and Assist. Prof. at the University of Architecture, Civil Engineering and Geodesy, Sofia. She is also a member of Bulgarian Chamber of Graduated Surveyors, International Society of Digital Earth and International Cartographic Association - Commission on Cartography in Early Warning and Crisis Management. She works at KartGeo Ltd. as a cartographer where her main activities are map design and editing. Her science interests are focused on thematic mapping for early warning and disaster management, cross-border mapping, mountain cartography. Prof. Temenoujka Bandrova is the President of the Bulgarian Cartographic Association and head of the Laboratory on Cartography and Erasmus coordinator for the Faculty of Geodesy at the University of Architecture, Civil Engineering and Geodesy, Sofia. She is Co-chair of the ICA Commission of Cartography and Children (2007-2011), а member of the Council board and a chair of Young Scientific Commission of International Society of Digital Earth (ISDE), a member of Commissions on Map Projections, on Cartography in Early Warning and Crises Management – International Cartographic Association (ICA); of the Association for Geospatial Information in South-East Europe (AGISEE); of Editor’s group of the International Journal of Digital Earth, Cartographia and Geoinformatika, Croatia. She is Project manager in DataMap Ltd. where her school atlases and maps are published. She is an author of 30 school atlases and more than 80 wall maps in geography and history, approved by the Ministry of Education and Sciences for Bulgarian schools. She published more than 100 articles, reports, papers, book chapters and edited books published by Springer and ESRI Press. She is the organizer of series of 5 International Conferences on Cartography and GIS. Mihaela Kouteva-Guentcheva is Associate Professor in the Department of Computer Aided Engineering at the University of Architecture, Civil Engineering and Geodesy, Sofia since 2013. She has worked for more than 20 years in the Central Laboratory for Seismic Mechanics and Earthquake Engineering at the Bulgarian Academy of Sciences (BAS), later Earthquake Engineering Department at National Institute of Geophysics, Geodesy and Cartography - BAS. She holds M.Sc. degree in "Civil Engineering – Structural Engineer” and “Applied Mathematics and Informatics” and PhD in “Solid Mechanics” in field. Junior associate at the Abdus Salam International Centre for Theoretical Physics – SAND Group, Trieste, Italy, 2001-2008. Her research and publications are focused on topics in engineering seismology and bridging engineering seismology with earthquake engineering, including strong motion data analysis, seismic wave propagation modelling, earthquake scenarios and seismic microzonation, dynamic analysis of structures. She leads and participated in several projects in the field of geodesy and geodynamics at national and international level. Eng. Stefan Bonchev is an engineer at the Laboratory on Cartography, University of Architecture, Civil Engineering and Geodesy, Soﬁa. He holds a Master's Degree in Geodesy and Cartography. His scientiﬁc and professional interests are focused on 3D cartographic modelling. He graduated a Training School “3D Geoinformation for Disaster Managment” in 2009 by COST Action TU0801 “Semantic enrichment of 3D city models for sustainable development” organized in Delft — Arnhem — Amsterdam, the Netherlands, 5-9 October 2009.